Publication details: Book. 2012. 123 pages. Publication date: 2012-11-09. Hardbound with many colored figures and tables. Open angle glaucoma (OAG) is one of the leading causes of impaired vision worldwide. The pathogenesis of glaucomatous optic neuropathy remains poorly understood, and several pathogenic mechanisms are proposed to coexist. As the world population ages, OAG will become more prevalent and advances in the diagnosis and treatment of glaucomatous optic neuropathy are important to protect and improve the quality of life of our aging population. Treatment of OAG has been directed at lowering intraocular pressure (IOP) which is the only current therapeutic strategy available to patients with glaucoma. While a wide variety of studies have demonstrated that lowering IOP decreases the risk of glaucoma development and/or progression, many studies have also shown that some patients continue to lose vision despite significant lowering of IOP. There have been many attempts to elucidate the etiology for the deterioration in glaucomatous optic neuropathy despite low levels of IOP. Over the past several decades, deficits in the ocular circulation of patients with OAG have become well established and these may explain the continued progression of OAG patients despite lowered IOP. The purpose of the present publication is to provide an updated view of ocular blood flow and vascular dysregulation in OAG. The importance of the topic was demonstrated by the focus of the 2009 6th Consensus meeting of the World Glaucoma Association which focused entirely on blood flow deficits in patients with OAG. Although a great deal of knowledge on vascular risk factors in glaucoma has already been established, many questions remain. Do ocular blood flow deficits precede glaucoma progression? 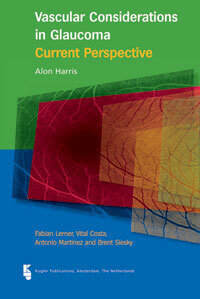 How does ocular perfusion pressure fit into the IOP and blood flow paradigm? What conclusions can be drawn from recent evidence showing the fluctuation of OAG risk factors including IOP, blood pressure and ocular perfusion pressure? We hope this update d current prospective will serve as a foundation for future investigations which will be designed to answer these and other important considerations in the management of glaucoma.